September 2015: The unprecedented formation of three simultaneous category 4 Hurricanes in the Pacific, and another in the Atlantic, marked the peak of the second most intense Pacific hurricane season on record. Image from NASA. At the time of writing (January 2016), the world is experiencing the strongest El Niño phase in living memory. The last few months have been littered with the sorts of severe weather events associated with periods of extreme El Niño: the 2015 Pacific hurricane season was the second most active on record, whilst intense heat and dryness in the western tropical Pacific amplified the destructiveness of the devastating fires in Indonesia, which released levels of pollution five times the level considered hazardous to human health. El Niño has been blamed for creating optimal conditions for the recent outbreak of the Zika virus in Brazil, and is expected to induce a warm, wet summer favourable to tropical mosquitoes, thus increasing the risk of the virus spreading to more temperate countries. El Niño is the label given to one half of the largest known climate oscillation, the El Niño Southern Oscillation (ENSO). The El Niño phase is associated with low air pressure and warm surface waters over the Eastern (American) Pacific, and high air pressure and cooler waters in the Western Pacific. The other half of the cycle is known as La Niña, in which the conditions in the Eastern and Western Pacific are reversed. A NOAA graph of sea surface temperature anomalies for a region in the central equatorial Pacific (Niño 3.4). The red represents the El Niño part of the cycle, and the blue La Niña. The extreme El Niño phases of 1982-83 and 1997-98 are easily recognisable as strong red peaks. 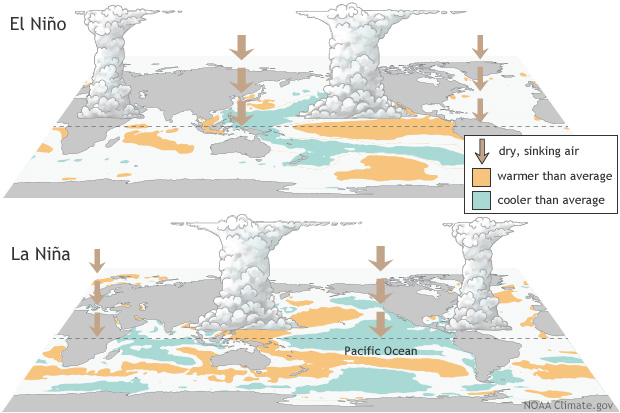 Changes to surface water temperature may not seem like much to worry about, but due to the high sensitivity of the atmosphere to ocean temperature these can trigger a cascade of global impacts well beyond the boundaries of the Pacific. The increases in ocean surface temperature boost convection between the lower and upper atmosphere, resulting in more thunderstorms. Evaporated water carries lots of latent heat which is released into the upper atmosphere during cloud formation, modifying atmospheric circulations worldwide. The impacts of a strong El Niño can be dramatic and far-reaching. Most often it is the poor in the Global South who suffer disproportionately, lacking the resources to cope with climate disasters. In 1997-8 an extreme El Niño led to widespread flooding in Ecuador, leaving 30,000 homeless and destroying the livelihoods of countless small farmers.1 During previous El Niño phases the Indian Monsoon rains have also been suppressed, resulting in huge losses to agriculture, a sector making up about 20% of national GDP and providing a means of living for almost two thirds of the working population.2 This time, however, it is the East African coast which is suffering from an El Niño-enhanced drought, the most severe to hit the region in fifty years. One might think that a solid understanding of the physical processes involved in the ENSO, combined with modern computing power, would enable us to predict and thus mitigate against the associated hazards. However, the sobering truth is that accurate predictions are well beyond our current capabilities. The ocean-atmosphere system is an agglomeration of small scale interactions displaying unpredictable, chaotic behaviour. Even with the most powerful supercomputers available, the approximations made in large-scale climate models severely diminish the accuracy of their predictions. As an example of the limitations of our current climate models, the Met Office produces a seven-day global forecast using a global ensemble model with a resolution of 33km3 – you could think of each 33km3 of atmosphere as a pixel on a video camera – which means important variations on scales smaller than this are averaged out.4 In this case the limiting factor is computing power, but the shortage of data and our incomplete theoretical understanding of the ENSO also constrain climate models. The ability of a small anomaly to evolve into a raging storm, together with the limitations of current models, makes forecasting extremely challenging. Yet forecasts are an integral part of the modern world. As well as their daily use by the public, the tracking and forecasting of hurricanes saves lives every year through early warning. Many organisations also import long-term forecasts into their risk management strategies. We can only hope that our theories, our data collection and our models improve at least as fast as the speed at which we are warming the planet, lest we find ourselves unprepared for what the ENSO has in store for us. 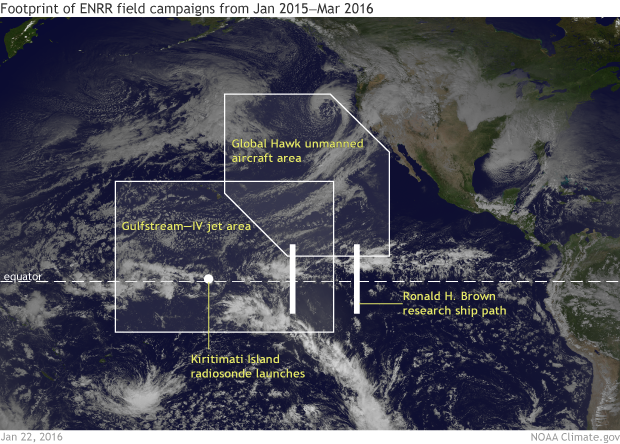 The “El Niño Rapid Response” campaign to monitor El Niño from land, sea and air. The outcome of collaboration between NASA and NOAA. Joe Rosettenstein is a second year Physics student at Warwick, and co-editor of Science and Technology at the Warwick Globalist.